Upon completion, each chair becomes a unique piece of functional sculpture ready to be passed on to succeeding generations. The chairs are constructed using time tested woodworking methods. 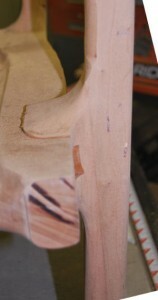 The front and rear legs are attached to the seat using finely fitted mortise and tenon joints. 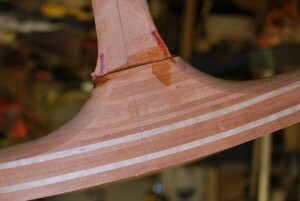 The joints are created using a combination of power and hand tools which enables such a tight fit. These joints, combined with today’s wood glues, create a construction stronger than the wood alone. 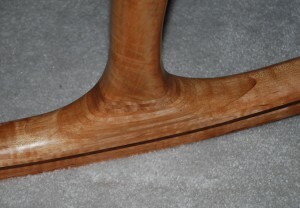 The flexible back braces are built from several thin layers of various woods clamped and glued into the desired shape. This type of lamination provides a strength and flexibility not attainable through the use of a single piece of wood. Of these four layers of laminations, the center two are usually Ash. Ash is a particularly strong and flexible wood which allows me to use a more decorative wood on the front and back of each slat. The decorative wood used each slat can be made from the same wood as the rest of the chair, or from a completely different wood thus making the back braces a decorative feature. Regardless of the wood type chosen, each set of slats is constructed to not only bring out the best of the chosen wood, but to enhance the overall look of the chair. Unlike the back braces, the rockers on my chairs must not be flexible. By using the same lamination methods, but with more laminations and a different glue, these rockers are solid enough for generations of rocking. Because of the structure of wood and the stresses placed on the joints where the rockers join the legs, the rockers are attached using a combination of epoxy and screws. These screws act as a mechanical connection between the two structures and by pulling the epoxy up into the leg, each joint becomes a single, solid construction. As each construction stage progresses, I use various tools to soften and shape the overall look of the chair. 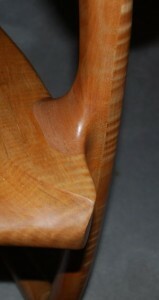 By using a grinder, rasps, and sanders, I am able to create the smooth transitions between each element of the chair. Visually, these transitions help guide the eye from element of the chair to the next, while physically enticing the you to run your hands over each surface.